Well, that’s more like it. 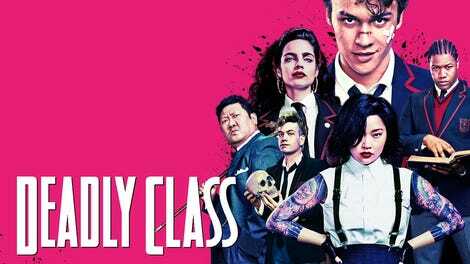 The problem with the first four episodes of Syfy’s Deadly Class was that they talked a big game about subverting expectations of the teen drama genre but then kind of fell into John Hughes-esque clichés like the teen dance and rocking house party. 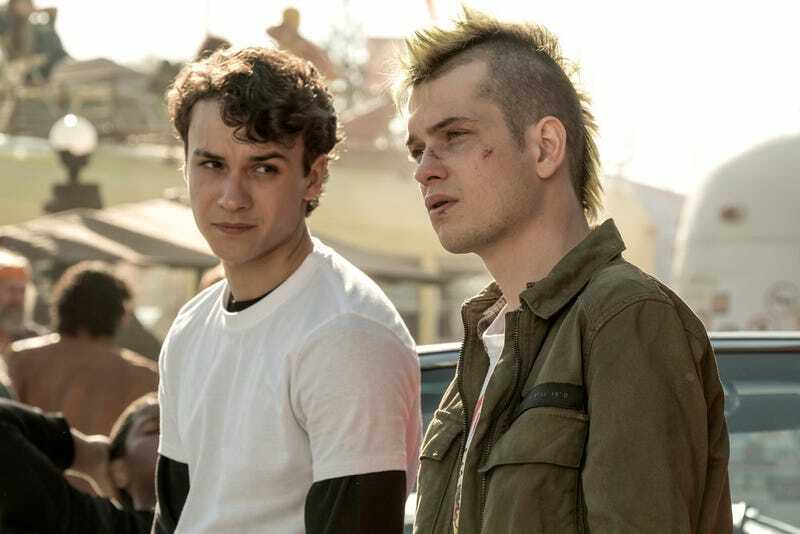 While a road trip is still a common teen show subgenre, this one ditches John Hughes for Hunter S. Thompson, allowing “Saudade” to fulfill the promise of adapting a book like Rick Remender, Wes Craig & Lee Loughridge’s trippy Image comic, playing with visual language and characters in ways that we don’t often see on TV. It’s also narratively risky, allowing its characters to do more drugs than a Bret Easton Ellis novel and then killing off one of its more interesting players. Keep it up, Deadly Class. Your grades are getting better. Billy wants to kill his abusive father. His abusive father is in Vegas. Time for a road trip! Marcus, Saya, Maria, Willie, and Billy are in a convertible on their way across the Nevada desert to the city of sin, with a jealous, heavily-armed Chico on their tail. They stop off at a hippie-populated rest stop on the way to score some drugs because Vegas & Vengeance don’t work without some serious hallucinogens. Maria and Saya do some coke in the bathroom while Marcus and Billy seek out some acid. The first hit they do seems like bunk so Marcus acts like a tough guy with the next seller. He calls himself “The Acid King” and downs seven tabs. Bad idea. A lot of what will unfold over the next hour is from Marcus’ deeply-altered perspective. At first, everyone is tripping hard, Marcus is just doing it seven times harder. And then the ‘deadly trip’ gets to the Strip, where the creators of Deadly Class have some serious visual fun. It starts with the expected, exaggerated versions of the bright lights of the city of sin and things like flying playing cards and gigantic dice, but then it gets much, much weirder. The visuals move through several kinds of animation, some of which look like the source material, some hand-drawn, some CGI, some black & white, etc. It’s kinda great in that it’s unlike anything else on TV recently in its visual excess. Sure, you could argue it’s over-the-top, but an episode about a car of young assassins going to Vegas and taking a lot of acid should be over-the-top, right? The refreshing thing is that “Saudade” doesn’t pull back from what it should be, unlike elements of the first four episodes. As they get to a casino called Big Top, Big Top (Circus, Circus clearly didn’t feel like giving up its name), Marcus reaches the “What if this never ends” phase of a bad trip. Saya tries to comfort him, but Billy has other plans. It’s time for some patricide. Billy’s dad is in the room next door, but Marcus is still tripping hard, even seeing Billy as Slimer from Ghostbusters at one point. Billy goes on his own and Marcus hears fighting. He rushes in to find Billy’s dad winning. He intervenes, blows are thrown, and then papa’s head connects with the corner of a coffee table and blood flows. Mission accomplished, but what will the trauma of it do to Billy? After a funny exchange with an Ice-T slot machine (actually voiced by Ice-T, saying things like “These slots are looser than your mother”), and an encounter with a casino security guard who knows he’s underage (as well as Marcus’ facially-scarred arch-nemesis), the real action of “Saudade” kicks in. Marcus bangs on Maria’s door, who answers in her underwear. They talk about pain and running away and then start making out. Marcus is about to lose his virginity when the door bursts open to reveal a gun-toting Chico, and he starts firing. Marcus flees and Chico chases him to a convenience store and starts beating on him. Marcus is losing consciousness as head trauma gets added to his head trip. The owner of the store pulls a weapon on Chico but the killer disarms him and then shoots him. Chico is killing innocent people now. He’s really lost it. He finds Marcus in an alley and does enough monologuing for the rest of the Deadly Scoobs to catch up. They point out that it’s against the rules to kill another student (although, apparently, Vegas store owners are fair game). Billy gets stabbed in the gut and Chico punches Maria before Willie finally gets a gun on Chico. But he can’t pull the trigger. Finally, Maria does what needs to be done, using her razor fan to slice Chico’s throat. Saya looks at Marcus & Maria getting close in the back seat as they speed off across the Mojave Desert. It’s time for a lesson on love triangles on Deadly Class. This was far and away the most loyal episode to the source material with many of the visual compositions pulled directly from panels in the book. I also loved the nod to someone dressed like Thompson in Big Top, Big Top. It was also a great episode for music with the following needle drops: “Our House” by Madness in the opening, the title-giving “Saudade” by Love and Rockets down the Strip which segues into “Canon and Gigue in D Major” by Capella Istropolitana as they get into the casino, “Holiday in Cambodia” in the convenience store showdown, the excellent choice of “To Have and to Hold” by Depeche Mode when Maria cuts Chico’s throat, and the awesome “Brother Wolf; Sister Moon” by The Cult in the end. The Cult rules. Michel Duval was one of the most charismatic performers on the show but I’m glad the producers didn’t change Chico’s arc because of that. A show like this only works with high stakes, and if it’s willing to sacrifice characters for the narrative.